Look how much the share spent on food and clothing increased during World War II, and how much lower they are now than at any time since. And I was surprised to see the share spent on education being quite low, and not showing as much of a spike in recent years, despite other stats that show the price of college skyrocketing. This could be because not everyone goes to college, and because although the rack rates for tuition have skyrocketed, more and more people get financial aid in various forms to cover a lot of it. And of course health care costs have risen hugely, after being quite stable through the '30s and '40s-- but it still surprises me that on average we spend more on health care than we do on housing. Lots of meat in that graph. 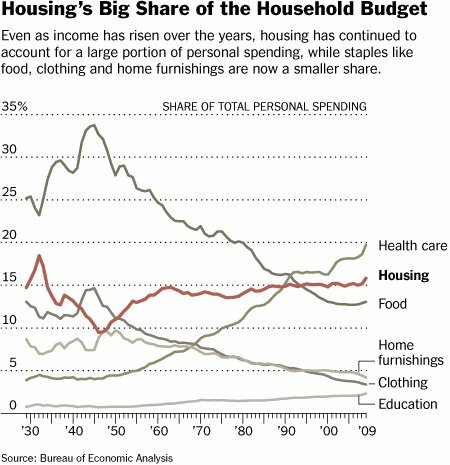 What I notice first is that housing, food and healthcare are almost equal costs. For me, housing = 4x food and food = 4x health care. I can understand health care being higher - aside from a few dental issues, I've been a non-user of healthcare so the cost to me is insurance only. But where can you live for what it costs to eat? Or what are you eating that you buy your mortgage/ rent payment? Unless the point is that home owners make money on their home long term? My second year of working, post-grad school, I doubled my housing and my food costs, so I think that's more bearish. I think people with more money tend to have more kids, thereby increasing both food and housing costs. Is that less bearish? Interesting to see how personal budgeting has changed over the years! Given the increased costs of housing and healthcare, it is more important than ever that people have smart savings plans. Trends are showing that these costs will continue to rise and it's important to be prepared. I think you may know Boston Gal? She's disappeared from the blogosphere.. can you reach her? Folks over at her site are worried..
Household expenses generally takes off major budget. Having to deliver some changes that you consider little things practically cost a lot as you will make an evaluation. Being creative and innovative will bring just an amazing budget reduction. That's amazing that healthcare is so high even for those that have health insurance. Leads me to think to think that a compulsory program like what we have coming up may end up costing people more than less. i agree jerry. this is some great info, it's always good to look back and see how our time period compares with the past. Interesting graph. I would never have expected that people spent less and less on food over the years. Nice and an impressive post.Your graph seems me quite interesting.Thanks for sharing with us such knowledgeable post.